Minsteracres is no stranger to returning migrants. Among others we’ve just welcomed the swallows back and the sheep have returned to the fields with their new lambs. One returnee took a little longer to find his way back however. Fr Joe Crawford first came here from 1963-1965 as a student, having begun his training the previous year in Broadway in the Cotswolds where a certain Fr Mark Whelehan was novice master. 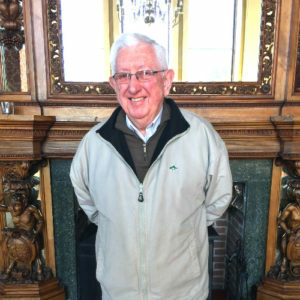 After his ordination at the church of St Mary’s in his home town of Sunderland, he spent most of the intervening years in various parts of the Middlesbrough diocese until his retirement 10 years ago. Then, like the swallows he headed south, in his case to the south coast of Spain where he was chaplain to expats in the diocese of Malaga. His time there was interrupted by another visitor familiar to Minsteracres – a heart attack. Unlike fellow sufferers Sister Cecilia, Frs Mark White and Whelehan , who each had a triple bypass, Fr Joe went for a full house with a quadruple. Although he carried on his diocesan work, he knew he wouldn’t be able to keep it up and eventually moved to the north of Spain to live close to a Cistercian monastery near Santander. Once again though, declining health intervened and, diagnosed with macular degeneration, he decided it was time to return to these shores. He wanted to live close to a monastery once again and looked at several but none met his needs. In the end he was drawn back to his homeland in the Land of the Prince Bishops and his former training ground. So it was that in February this year he settled into a converted stables block near Stocksfield just five minutes’ drive from Minsteracres and he now joins the community for morning mass. He also acts as supply priest whenever needed, “I’ve told Fr Jeroen I’m happy to help whenever the need arises,” he says. We hope this swallow might kick the migrating habit this time and stay! 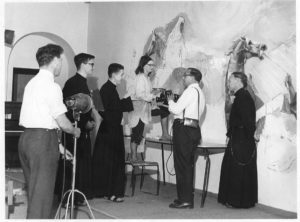 Fr Joe (3rd from left) with the artist Sheila Mackey in 1964 when she was commissioned to paint the murals in the retreat house.